The Allard property is located 175 kilometres north of Amos (Abitibi, Quebec) in the Desmazures township. The property is accessible throughout the winter, but difficult in the summer. 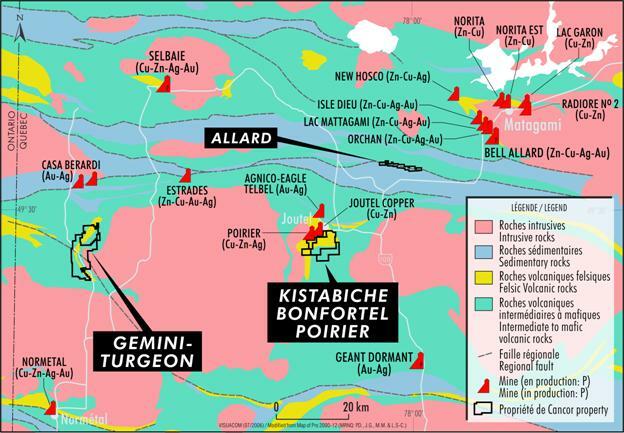 Yorbeau holds a 51% interest and Teck Resources holds the remaining 49%. Beginning in the late 1950's various companies conducted aerial and ground geophysical surveys as well as drilling 76 reverse circulation drill holes and 37 diamond drill holes. In total 6900 meters were drilled. Cancor has explored the central portion of the property with IP and magnetic surveys. The Allard property is located inside the Harricana-Turgeon belt, south of the Casa-Berardi fault, a major regional geological feature with associated known gold mineralization and deposits. It is underlained by a narrow band of clastic sedimentary rocks belonging to the Taïbi Group. The band is squeezed between mafic volcanic lavas to the north and an assemblage of mafic pyroclastic and volcanic rocks with graphitic horizon to the south. An iron formation occurs at its northern limit with the northern mafic volcanic rocks. Anomalous gold concentrations were found at two locations, Zone A and Zone C, within an altered shear zone rich in quartz and weakly mineralized in sulphides. This 10- to 15-m thick shear zone is located midway between an iron formation and a graphitic zone. It extends for more than 8.5 km on the property and extends toward the southeast on the neighbouring property, where an intersection 3.6 g/t Au over 4.1 m at was cut in a drill hole located 400 m from the eastern boundary of the property. Zone A extends over 1400m. Drill hole testing has yielded up to 1.53 g/t Au over 2.0 m and 1.08 g/t Au over 2.0 m.
Zone C extends over 1,200 m. Drill hole testing has yielded 2.0 g/t Au over 4.0 m and 6.69 g/t Au over 1.0 m.
The geological environment and the nature of the gold mineralization on the Allard property show strong similarities with the gold mineralization of the known deposits in this area.